Varroa resistance breeding is now for us a feasible and promising way. The beekeeping system of Ed & Dee Lusby, with small cell bees, represents for us a basis which allows the bees to actively defend themselves against the Varroa mites. The additional use of selective breeding, in accordance with the experience of Harbo, gives us the opportunity to bring Varroa tolerance breeding in Europe to success what was not prosperous the last 40 years. The investigations of our small cell hives on VSH (Varroa Sensitive Hygiene) shows us the mechanisms how the bees actively defend against the Varroa. Now it is up to us in the working group to put it into reality, because we are now in the fortunate position to have all the necessary basics. We will establish a working group of resistance breeding in our group, and all who wish to cooperate are cordially invited to attend. The other day I received Imkerfreund 12-2013 in my postbox. In this issue of the German bee magazine I found an interview with the scientist leading a varroa breeding project involving beekeepers. It’s a project that has made some progress. Germany has had varroa for about 40 years. And they mostly try to breed pure Carniolan bees (carnica) and pure Buckfast with the help of isolated mating stations (and insemination). 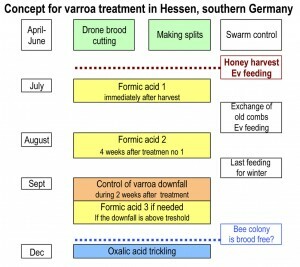 The main varroa treatment concept is the following in the south of Germany. Their breeding program has two resistance parameters: pinkilling a square decimeter of brood (similar to freeze killed brood) and measuring the development of the varroa population during the season. Besides traits like low swarming, good temper and a honey crop. Their progress: being able to skip one of the summer treatments with Formic acid (as far as I understood the German article). 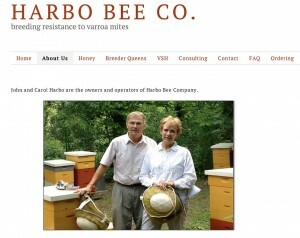 USA has had varroa for about 25 years. Few try to breed pure race bees like the Germans. Ineminated and naturally mated queens are used. The main varroa treatment concept for smaller operations are aimed at organic treatment (involving formic acid, thymol, drone cutting, hops) and treatment free (involving small cell size, topbar hives). Bigger operations most often trust different syntetic miticides, formic, thymol and hops.) Americans are more focused on treshold counts of mites for the time to treat. The Russian bees from the very east of Russia, the Primorski area, is one quite succesful undertaking started and developed by the USDA. A number of beekeepers have formed an association to take care of the 18 lines of these bees. They are treated much less than ordinary bees against varroa. With these bees you have to watch out for swarming. There are those in Europe forming good projects and those already not treating against varroa either, but with this article I want to get attention to how little progress is made with the strategy mentioned above in Germany and how great achievement is made with the VSH-breeding, focused at the start on one trait: VSH. Then on the other. Something has to be learnt here. Actually resistant bees were achieved already after very few years, by Harbo and Harris in 1995-98 in USA. They started with survivor colonies of any type of bee they were given. The only one parameter they focused on first was VSH: Varroa Sensitive Hygiene. See other articles here in the VSH category. This development of resistant bees have to be done in all kind of regions differing in climatic and other local characteristics, mites and pathogens for example. It’s time for Europe to learn the lesson and form breeding projects together with beekeepers where ’central’ areas are formed fairly isolated from other bees. All bee colonies in these ’small starter’ areas are part of the program. An effective way of using funding money from European Union would be to support such projects. But in my eyes Europe could contribute significantly by activities of bee breeders. The idea to use already varroa resistant bees for breeding was first established by Erik Österlund (1989) and John Keyfuss (1993), who cross African bees into A.mellifera mellifera/Buckfast. John uses a Tunisian bee (Apis mellifera intermissa) and Erik Apis mellifera monticola from Kenya. The resulting Elgon bee is since a bee that needs less or even no varroa treatment. The same is true for Keyfuss bees and he gain merits by bringing this topic into broad public interest with his “World varroa challenge”. This approach was copied by Rinderer (RHB), who used Russian bees that lived since 200-250 years with varroa mites and hence, should have developed resistance traits. The same idea was practically followed by P. Jungels (Buckfast – Primorski mixes) and J. Koller (pure Primorski) (Primorski synonyme for russian bees) in Europe, who contributed significantly by providing varroatolerant queens to the European bee keepers. A guy that use local (carnelian) bees for his breeding program is Alois Wallner from Austria http://www.voralpenhonig.at/, who bred since 1990 for bees that groom and kill varroa mites by removing their legs. The result is now a bee that kill nearly every mite (varroa killer factor 100). Additionally his bees express VSH behaviour and hence, bees need only few or no treatment with formic acid.